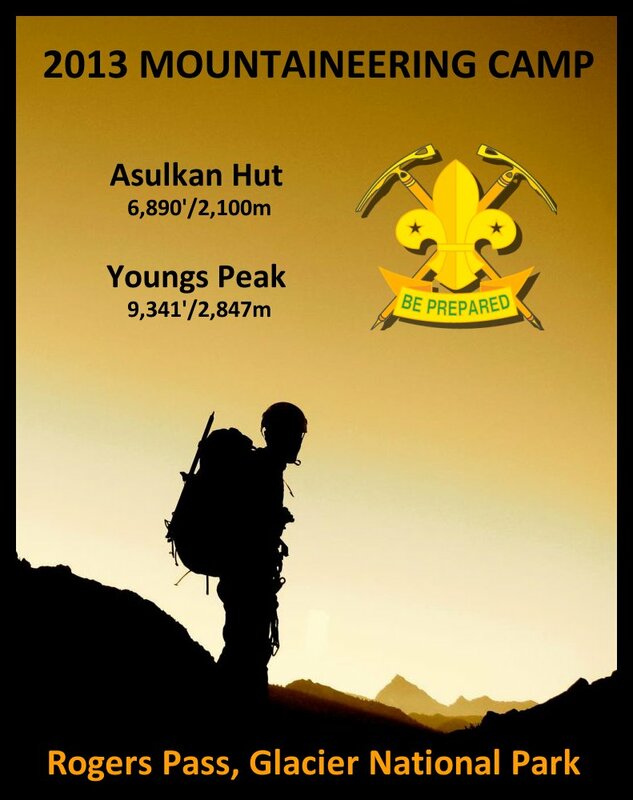 10 youth: Half guys; half gals – Half Scouts; half Venturers – Ages 11-18. One week at the Alpine Club of Canada’s Asulkan Hut (7,000′) in Rogers Pass, Glacier National Park, B.C. Three days of mountaineering training then……climb Youngs Peak (9,341’/2,847 m)! We owe a very special “Thank You” to Parks Canada for allowing us to have this amazing week in Glacier National Park. Vérèna: Thanks for believing in this project! Note: Click on any photo below to start a full-screen slide show with captions. Our first look at our home for the next week: Youngs Peak (9,341 ft./2,847 m.) and Asulkan Pass . Saturday morning in the valley at Wheeler Hut. Time to head up to our high camp at the Asulkan Hut. The team from left to right: Ben (almost 12), Simon (14), Sarah (13), Jason (old), Meredith (16), Keir (11), Svetlana (13), Emerald (14), Jessica (17), Keiran (15), Alistair (old), Zachary (18), and Keiller (really old). Six of the youth were from North Vancouver; two were from West Vancouver; one was from Golden, B.C., and; one was from Fall River, Nova Scotia. Most of the participants in the 2013 Mountaineering Camp had extensive experience with canoe camping but no experience backpacking high up into the mountains. These young people are about to find out that they are a lot tougher than they might ever have imagined! Winter avalanche debris still lingers at the base of some of the slopes. After a few hours hiking up through the valley, the trail starts to get more…interesting. When you’ve hiked all the way to the end of the valley, you cross this bridge and then….you go UP! The trail goes up along the top of the knife-edge ridge of the moraine in the centre of the picture to take us to the cabin at 7,000′. Almost there! A few small sections of the moraine trail were snow-covered on the way up (snow-free on the way down). “Here comes dinner!” Photo by Jason Gadd. The Asulkan Hut as seen by a GoPro video camera mounted to the front of the helicopter. Our food for the week is delivered to us (along with six fresh, hot extra-large pizzas for dinner tonight). Thanks to Alpine Helicopters of Golden, B.C., for their generous assistance with this project! We really needed to air-lift in our food for the week since it weighed at least 300 lbs.! Nothing to cook tonight thanks to Red Tomato Pies of Golden, B.C.! Well earned after a hard hike up from the valley with full loads! With Telus 3G service at the cabin and Goal Zero solar recharging systems, we’ll be on-line all week. Our newest gizmo is our DeLorme inReach SE satellite tracking and communications device! The team is looking good in their 2013 Mountaineering Camp hats! Back to the cabin for lunch. Sunday afternoon: ice axe self-arrest practice. Enjoying a good book and the last of the late afternoon sun while waiting for dinner. Nice view of Rogers Pass from the front porch. The sun is gone…time for some indoor activities. Propane wall lamps provide a warm glow to the hut. Nothing beats a cozy cabin and good company in the mountains at night. Good night from Rogers Pass! Monday morning. Today’s lesson: introduction to crampons and roped travel. Happy Canada Day from Glacier National Park! Scouting is cool! You get to go camping in the most spectacular places, learn all sorts of awesome new outdoor skills and have the most amazing adventures… Oh, and if you want, you can bring your kids along too! Everyone puts their best spiked foot forward. So who can walk up the hill without nicking their pant legs with their crampons? Clean up after another yummy lunch. Scout Sarah rocking the “Blue Steel” pose. Scout Svetlana working her interpretation of “Quiet Reflection”. Scout Emerald tears up the “Little Mermaid” pose. Scout Keiran nails the “The Bolt”. Venturer Zach taking “The Thinker” out for a spin. Scout Ben powns “The Discoverer”. Scout Keir gives “The Scout” a go. Venturer Jessica is “The Poet”. Venturer Meredith becomes “The Explorer”. Sarah tries her hand at snow rappelling. Meredith takes a turn too. Time to put all this training together and go for a little walk up towards Youngs Peak. Don’t let anyone tell you that mountaineering is “child’s play”. These 11 and 12 year-old Scouts know better than that! A rock formation called The Pterodactyl overlooks Rogers Pass to the north. Taking a moment out to enjoy the view. Photo by Meredith Faulkner. “Alpine start”: up at 4 a.m. and out the door by 5:30 a.m. The morning sun starts to punch through over the mountain. The headwall. This is the trickiest part of the climb since it’s the team’s first go at a fairly steep slope. None of my photos truly conveys how steep this wall is. This photo by Jason Gadd better captures the steepness of the headwall. Piece of cake! The youngest two team members (11 and 12) clear the headwall and are ready for more! Photo by Jason Gadd. On top of the headwall. It’s clear sailing now to the top! Just don’t fall in any….well, never mind. Just stay on the trail and you’ll be okay! On the summit! Some of the youth are flashing their age with their fingers. Scouter Alistair is impressed by the vertical drop behind the rocks everyone is sitting on. The Illecillewaet Névé stretches out behind Scouts Simon and Ben. The big boy of Rogers Pass, Sir Donald (10,774’/3,284 m), rises just north of Youngs Peak behind Mountaineer Scout Keir. Ben (left) celebrated his 12th birthday on the summit. The four gals on the summit team (left to right: Meredith, Jessica, Svetlana and Emerald) relaxing with (left to right) Mt. Macoun (3030 m), Mt. Topham (2900 m) and Mt. Fox (3196 m) rising in the distance behind them. A screengrab from a GoPro video taken on the summit by Meredith Faulkner. One camp badge for young Ethan and one to be left under the summit cairn. Jason strikes a jaunty pose with Mount Macoun (3030 m) rising in the background. Getting ready to head down. Heading back to the steep headwall. Thursday morning. Today’s lesson: introduction to crevasse rescue. Optional: explore Asulkan Pass. Otherwise: free day. One last chance to head up the hill and explore a bit. It’s been a great week and the weather is just too nice for too much more classroom stuff….time to call it a day and have some free time! Friday morning. Time to head down the mountain and onto the next adventure. Not sure if the moraine is harder coming up or going down. Our destination is 7 kms. away out towards the highway just visible near the top of the photo. It’s amazing what a week in the mountains will do to a person’s strength, confidence and swagger. This adventure is almost over. But….there’s always next year! The week ends at the Rogers Pass Visitor Centre. Looking back. The hut and the route to the summit. Happy trails. We’ll be back next year! Note: You can raise the resolution for each of these videos to 720p or 1080p to substantially improve their image quality! Note: The Scouts didn’t know that the helicopter was bringing them fresh, hot pizza for dinner. We had only arrived at the high camp a few minutes earlier after a challenging hike up the mountain. I love it when a plan comes together! A 360 degree pan from the top of the Youngs Peak headwall as we descend back to the Asulkan Hut. This is what we call “High Adventure”! Posted on September 7, 2013, in Mountaineering Camp and tagged 2013 Mountaineering Camp, 5th Mountaineer Scouts, Alpine Club of Canada, Asulkan Cabin, Glacier National Park, Mountaineering Camp, Rogers Pass, Scouts Canada, Youngs Peak. Bookmark the permalink. 4 Comments. Thanks sooo much for putting up all these fantastic photos – much appreciated. Check out this awesome adventure the the 5th West Vancouver Mountaineer Scouts had this past summer! A very unique camp for a unique Scouting Group (very envious). It makes me wish I lived on the west coast. I hoping to explore this program more in the near future so stay tuned. Ken: There will always be an ice axe and a pair of crampons waiting for you whenever you can come visit us! That’s a big jump up in size of my latest 60′ conquest, but thanks!